Leia Carrico, 8, and her 5-year-old sister Caroline, said in an interview Monday they went on a hike last Friday past a marker that their parents told them not to pass because they wanted an adventure but lost their way home. “I just wanted a little more adventure, I said to go a little farther,” Caroline said. Leia said her sister cried the entire first night and she told her to think happy thoughts as they huddled under a tree branch close to the ground. “I thought of going to the park with mommy and daddy. I thought of going to the ocean. I thought of everything I remembered, but it didn’t work,” Caroline said. Leia kept watch both nights and thought about the good memories from a family vacation to Monterey, California, she said. She said she also remembered what she learned from watching movies of people surviving in the wilderness, going camping every summer and the training with their local 4-H club. She also thought of her father’s advice to stay put if she ever got lost. “I knew dad would find us eventually,” she said. 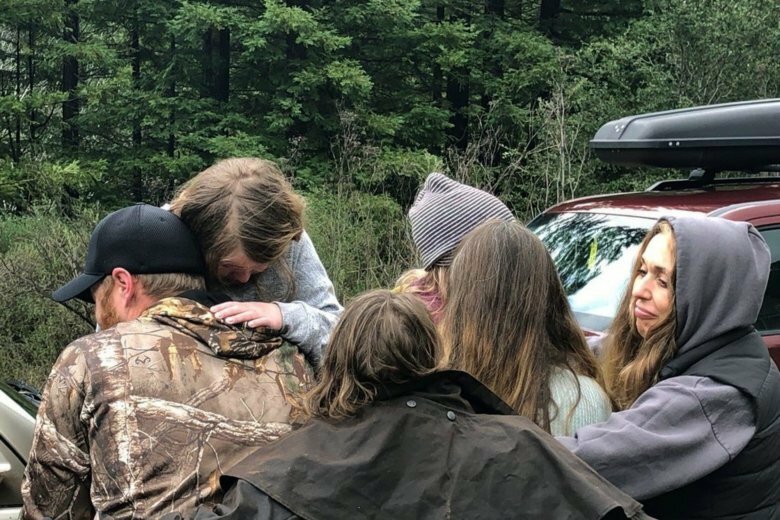 Two volunteer firefighters who joined hundreds looking for the sisters found them Sunday in a wooded area about 1½ miles (2.3 kilometers) from their home in the small community of Benbow, about 200 miles (320 kilometers) northwest of Sacramento. Delbert Chumley, a Piercy volunteer firefighter, said he and fellow volunteer firefighter, Abram Hill, found the girls after calling out their names during a long hike through rugged terrain. “I thought we heard someone say ‘dad’ and so then we called out again and they said yes we are right here,” Chumley said. The girls’ mother, Misty Carrico, said she is trying not to punish them. For now, the girls are not allowed to go far away from their house until they have a GPS trackers, which their mother has already ordered.